We welcome you to our Sunday Morning Buddhist Ceremony and Alms / Lunch Offering. 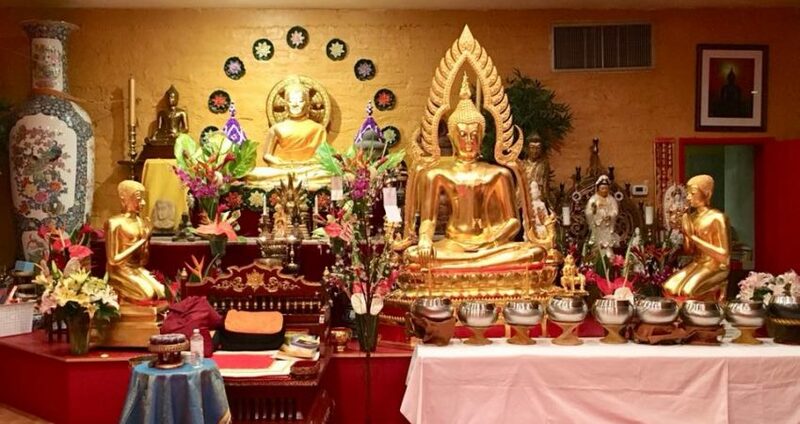 This ceremony will be held every Sunday morning at Wat Buddhametta/Tucson Meditation Center on Swan Road just north of 22nd Street to serve our Buddhist and non-Buddhist community members in Tucson and from nearby towns. The Ceremony is normally led by the Abbot, Ajahn Sarayut, the Sangha, and joined by lay community members. It includes taking the Three Refuges and Five Precepts, morning chanting, meditation and a Dhamma talk by Ajahn Sarayut Arnanta and/or others. Do not let the fact that you are new to Buddhism or to Wat Buddhametta stop you from joining the ceremony. We will help and guide you. Please note that on the typical Sunday, the ceremony will be in English but on certain special occasions, there will be many Thai community members so the ceremony will be both in Thai and English. When you first walk in, you will be greeted by someone at the entrance or in the Common Room. They will guide you. Greetings in the Wat are done using the gesture of Anjali which is the two hands joined together at the heart and a slight bow of the head. When greeted by the monks, the Maechee ( a white robed Buddhist nun) or the Anagarika ( a white robed Buddhist man), please use the Anjali gesture but raise your hands from the heart to the forehead. When you enter the ceremony room which we call “The Buddha Room” you may offer another bow toward the altar or simply walk in quietly and find your place on a cushion, a bench or a chair wherever you will be comfortable. If you arrive before the ceremony begins you may spend some time to meditate on your own in the Buddha Room. -Three bells to call everyone’s attention followed by brief moments of silence. Following Sunday morning ceremony, there will be an opportunity to offer food alms to the Sangha: monks, a Maechee (a nun) and an Anagarika and then to join together as a community for food and fellowship afterward. Please feel free to bring a dish to share with others. Some may not be able to stay for the alms offering. Please feel free to leave at any time following the ceremony. Wat Buddhametta understands that many people lead busy and demanding lives.They often cannot fit a day-long ceremony, celebration or alms offering opportunities into their busy schedules. The Sunday Ceremony offers a shortened ceremony and a more convenient time in which everyone can enjoy practicing and hearing the Dhamma as well as offering alms and enjoying fellowship. Remember, our Sunday Ceremony will be held every Sunday at the same time. We hope to see you there!